“Go no further,” intones the Sandman towards Miss Belmont. His well meaning warning is strikingly wrong, of course. Those of us with Dian Belmont‘s inquisitive nature understand that bloodshed and death is of precise interest to humans. We have to know why such things happen, why such evil is in the world. 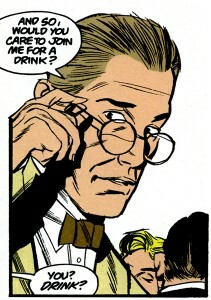 Does The Sandman have answers? Probably not, not to the big why, but such a book, such stories, can point the way to understanding and show the right paths to take in a twisted world. 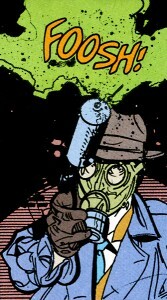 Sandman Mystery Theatre Vol. 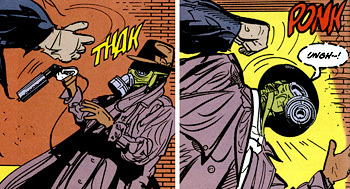 2: The Face and The Brute follows The Tarantula (recently reviewed) in collecting Matt Wagner‘s Vertigo series about the 1930s adventures of original Sandman Wesley Dodds. As the title implies, there are two stories here, precisely doubling the volume of the first book in the series (along with double the cover price, of course.) Unfortunately, previous artist Guy Davis, who won me over in the last volume, isn’t featured here. 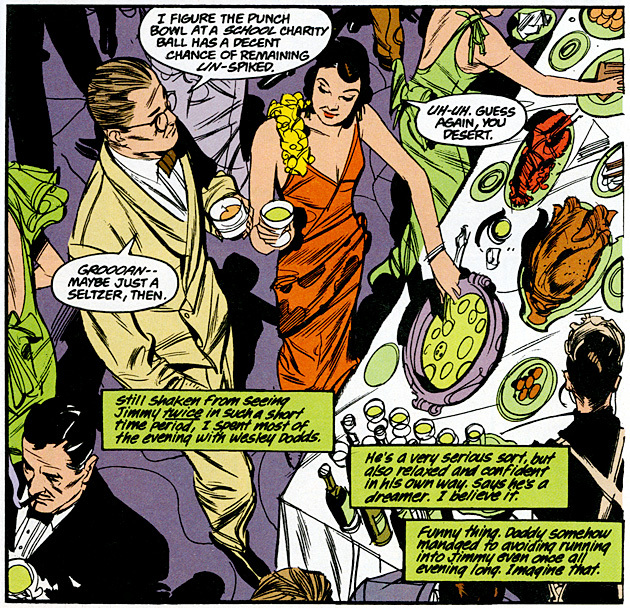 The first is The Face, illustrated by John Watkiss, revolving around conflict in Chinatown. This story pushes the racial tensions hinted at in the first book to the forefront. The second story, The Brute, with art by R. G. Taylor, hangs under a cloud of class warfare, with a heavy focus on those who suffer most from poverty – the children. You’re forgiven if it sounds like the book is a little preachy from that description. Both stories are more complex and one sentence summary won’t do them justice. Still, it’s worth noting that these themes (and especially in this time period) are well worn in other forms of literature, and are perhaps more notable here for their publication as comics and inclusion of a masked adventurer. It’s almost as if Wagner is covering the basics first, making sure his audience has familiar ground to step from. Of course, these stories were produced more than 15 years ago, and although the themes are familiar from literature published more than half a century ago, the SMT stories are very forward for the comics of the time. While sophisticated in technique and adult oriented, they don’t often succumb to being dark just to be dark – the hero is still a hero and a moving one at that. 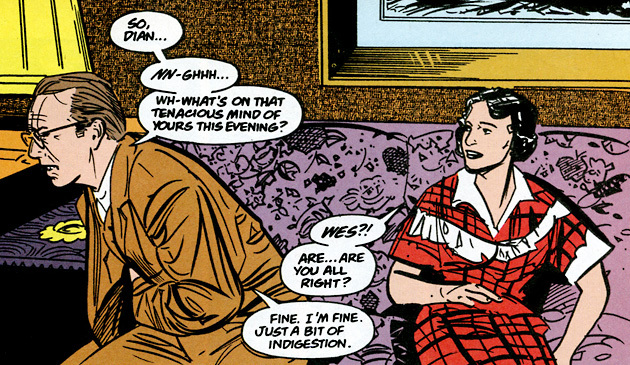 Additionally, Dian is one of the best female characters I’ve ever read in comics. Belmont continues to be the main character in The Face, which revolves to a large extent around her friendship with Jimmy Shan, an dashing gentleman she met while working as a Law Clerk. There’s a gangwar on the verge of eruption in Chinatown and as a man of intellectual means but humble beginnings, Shan’s involvement is sadly assured. Complicating things further is the mysterious Face, a strange character destined to clash with the other weirdness in the night, The Sandman. The most interesting turn of events is that while Dodds succeeds in tracking the Face to his lair, it’s Dian who actually prevents his next killing at that very moment. The lass proves her tenacity and intelligence once again. John Watkiss works with bold linework and the hatch filled uneasiness of the first story isn’t to be found here. It may sound like an improvement, but the result isn’t as perfectly suited to the title. The strong and lithe frame of the impressive Shan is quite intriguing, but I wasn’t as attracted to the way Watkiss works with the main characters. Dian and Dodds seem much less expressive, with Wesley carrying a more standard Bruce Wayne-ish frame. 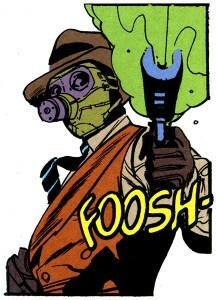 While The Sandman looks pretty slick, his mask is also more sleek, less baggy and realistic. Honestly, though, it’s not that he doesn’t look good – it’s that I enjoyed how he seemed kind of awkward. Him being cool seems a step back from his more unique characterization in the previous volume. 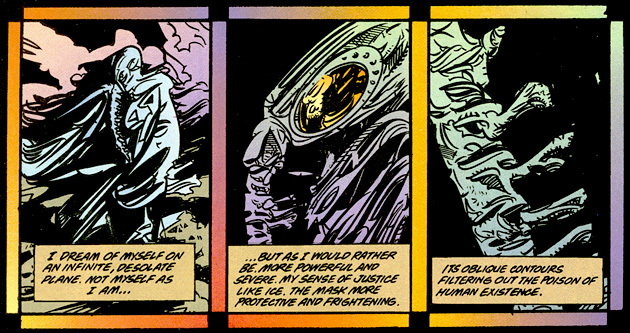 The Face’s true nature is suggested mostly in shadow for the first part of the story, and when Watkiss actually reveals him it’s a bit of a disappointment. It’s hard to express it in a single panel – I often find that a problem with bad art is it becomes good if you stare at it long enough. In any case, things were strange enough to pull me out of the story. Dian often portrayed the most awkwardly, a shame since the weight of the plot is on her shoulders. Even though I’ve seen Watkiss do some amazing art, I was underwhelmed here. In The Brute, Dodd’s investigation of a wealthy fight promoter soon spirals into variety of horrible events related to man’s lust and vices. A young fighter with a daughter to support tries to do the right thing and the elder fight promoter seems incapable of doing anything but terrible wrongs. 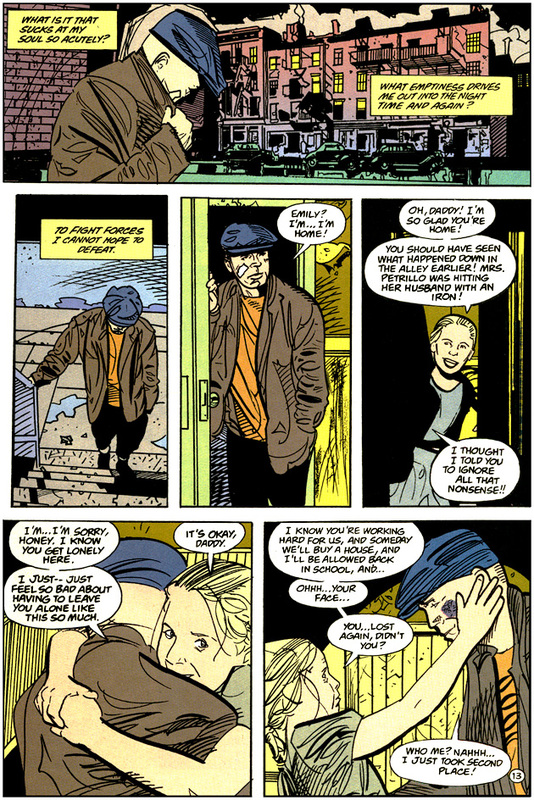 One thing I didn’t mention in my first review was the one page dream scenes that accompany Dodds’ adventures – they have brief appearances of Dream from Gaiman’s Sandman, and suggest a sort of precognition. These nightmares are entirely missing from The Face but return in The Brute. I suppose the creators decided they did help set the tone. The art for The Brute is perhaps halfway between the work in previous arcs – thinner lines, but also the thinner figures. Dodds is characteristically serious but without quite as much feeling in his eyes as when Davis draws him. The young boxer, Ramsey, is expressive though, especially towards the end where his pain radiates off the page. And the primary villain of the story moves between smarmy business dealings and gritted angry teeth with admirable rendering. Everyone suffers from some staleness – that problem some artists have where their figures seem to be standing still, mouths wide, instead of actually in the midst of action and conversation – but the characters new to this arc much less than our reoccurring cast. There’s a problem, perhaps, with a rotating team of artists. When the one who introduced the characters does so well, it’s hard to find footing near that peak. Between the two stories, the further development of our heroes is the fascinating, as well as being the most satisfyingly executed. It’s in the details of the slightly threadbare twists and turns where this book suffers. For a “Mystery Theatre,” the actual mysteries are extremely predictable, as was the “shock” moment in the second book, which provides Ramsey’s final motivation. I feel that if you have anger more at the storyteller for allowing their pawns be so amazingly stupid than at the bad guys for doing what bad guys do, then it’s something worth mentioning. While the victims of the terrible circumstances are mostly understandable and human, the big league sinners seem less so. The eventually revealed string puller in the first book has quite thin motivation and simple profit and pleasure is on the mind of the second. A lesson could be taken about the shallow needs of mankind; those with evil in their hearts motivated by the basest of desires. But it wasn’t entirely gratifying as a morality play. Perhaps my main complaint with SMT: The Face and The Brute is that it feels like Wagner has much better in him. It’s 12 issues in and the scene is just being set, intriguing characters over familiar stories (in slightly different settings, perhaps), nothing a reader of the crime or gritty superhero genre hasn’t seen before. The players are the strength, but the scenario has yet to startle me. 3.5 out of 5. Wonderful character development weighed down by hit or miss art and too many predictable plot points. There are moments here that make this book valuable for fans interested in Dodds and Dian. SMT isn’t a particularly important series to the rest of the DCU, but holds a historical cornerstone, well representing the “mystery men” of early adventure comics and their transition to more recognizable superheroes – all with a dark and modern storytelling approach. 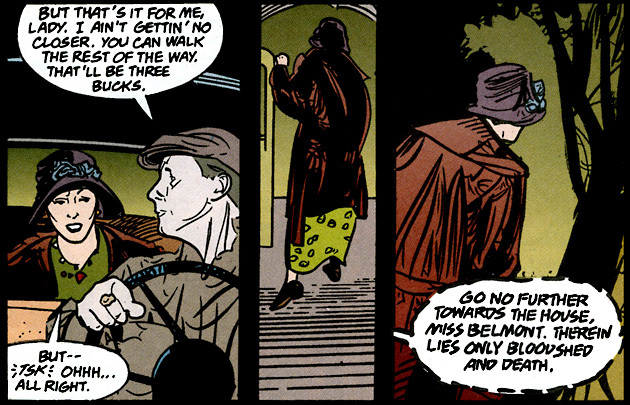 You should read Sandman Mystery Theatre Vol. 1: The Tarantula first. There is more general discussion in the verdict section of that review. 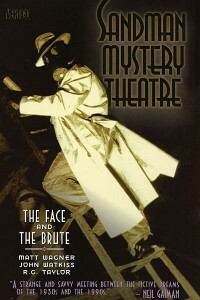 The next book is Sandman Mystery Theatre Vol. 3: The Vamp. We’ll be looking into it soon as we review our way through the DC Universe! I have to say I only have the first volume of this series so far and the rest were on my to buy soon list, but on reading this review I think I may bump it down the list for later. Of course I will most likely change my mind if the reviews of the next few volumes turn out to be bit more complementary. I still have a lot of hope for them. Davis returns for the next volume and seems to be the series’ regular artist. And it was still a fun read – I just try to judge comics by how successful they are at what they attempt. This one seemed to hope for intriguing mystery, but didn’t deliver as well there. Still worth checking out just because of its relatively unique setting and approach.